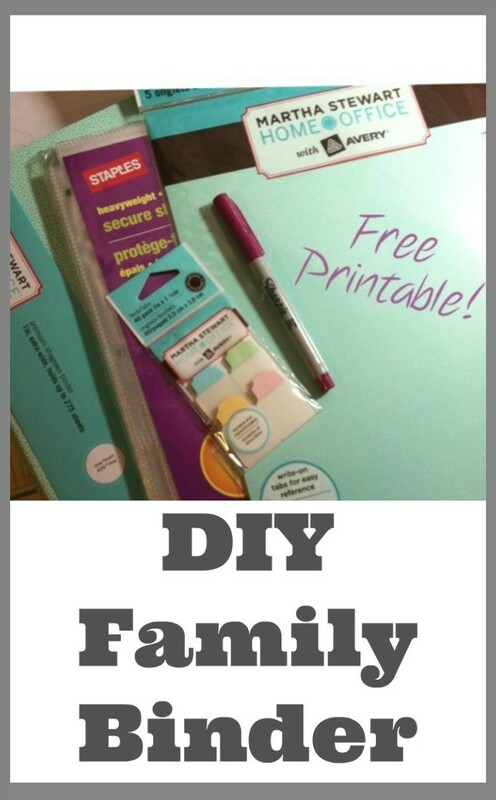 Home LifestyleHouse	Make your own family binder with free printables! I mentioned yesterday that I decided to make a family binder to help me get organized. Part of it is an honest and true desire to get the home management part of my life under control. Another part of it is an excuse to buy office supplies :-). I had a coupon for the Martha Stewart line at Staples so I started my journey there. I grabbed a binder, some stick on tabs, some page dividers and plastic page protector sleeves. As it turns out, however, the tabbed dividers were smaller than the page protectors so I can’t use them. I decided to stick with the page protectors because I want to keep my pages nice and I also plan to use a dry erase marker to check the boxes on the chore pages! I found some great resources for printable pages and grabbed almost all of them from those sites. I also created my own page that I am sharing with you for free! At first I wanted to list my meals in the calendar, but I decided that would really crowd the calendar space so I went with this separate meal plan page from The Project Girl. 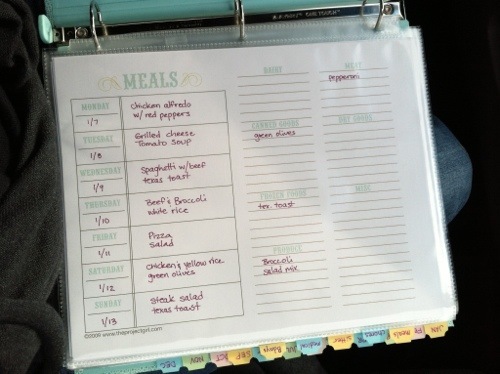 I love how she has space for the week’s meals on the left and a grocery list on the right. I also wanted to make a master meal list so I can have all of our “usuals” in one place. The idea behind that is to make the planning much easier and allow for more variety. I seem to get in a rut with the same 8-10 meals over and over. I know we like more than that, but I often forget them when I am planning. 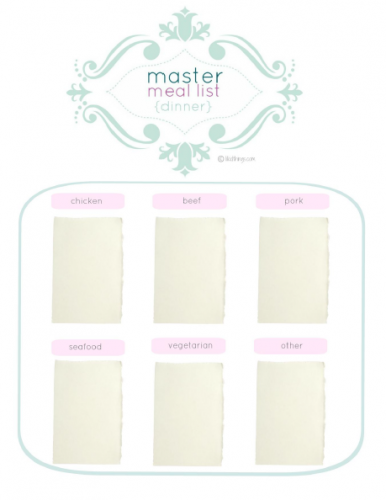 Free Printable Master Meal List! I decided to make my own printable to share for the Master Meal List. Feel free to print and use (personal use only please)! This one is for dinner but if you would like to see other meal times, just let me know! The file is a pdf so make sure you have Adobe reader installed so you can print. Enjoy! Do you use a family binder? What else do you have in there? Want more? You can read about the AboutOne Organizer and the 3 Steps I Use to Organize My Thoughts. Ohhh your master meal printout is so pretty! Thank you for sharing it with us. I saved Organizing Homelife’s 31 days to organization on my computer, just need to get some ink and then I’ll print it out. 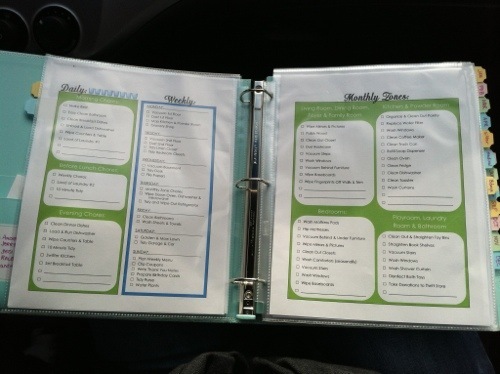 A great printout for a binder would be vegetable seasons and a quick breakdown of care. Thank you! I am looking for this printout I found years ago with the vegetable seasons. It’s awesome! If I find it I will link it up too. Good call! Like you said – struck a gold mine! Thank You so much! So glad you can use them. Enjoy!